Bumper & Hamster Balls – BigFun! Climb into these inflatable spheres and then roll and bump your way to the most fun you’ve had in long time! These vinyl inflatable balls are sure to be a hit at any event, and can be used both indoors and outside. 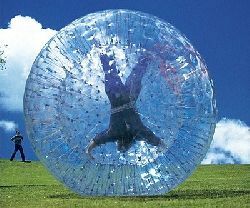 Great for playing a soccer game or simply rolling around!